We introduced our omni-channel A2P messaging API in our most recent webinar and one of the things discussed deserves a bit more detail: Messaging channel audience overlap based on the geographical market. It’s commonly known that smartphones are widely used today. That is if you live in Europe, the United States and Canada. So if you’re sending messages to people in these regions, your Viber audience is part of your SMS audience. The same goes for WhatsApp and other OTT platforms. Yet we have many customers that operate their businesses in emerging markets as well. While smartphone penetration based on the percentage of the population is over 70% in the aforementioned regions, places like Mexico, Brazil and most of Latin America have under 50% smartphone penetration. Mexico’s smartphone penetration, for example, is only at 35%. It’s a similar story in many Southeast Asian, emerging African and Eastern European countries. Just look at the map below. 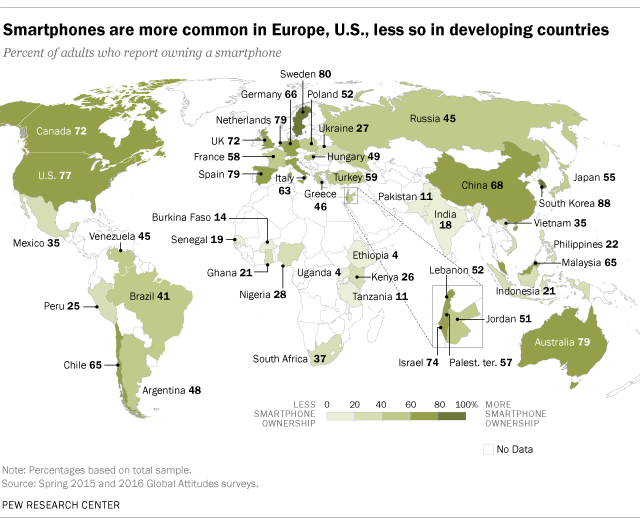 Areas of the world that have a smaller smartphone market typically lack 4G and 3G network coverage, which makes buying a smartphone lose its appeal. This creates a challenge for rich-content messaging platforms, as they can’t be as widely adopted. SMS continues to be the de facto messaging platform in emerging markets, especially for A2P messaging, since you know you’ll reach the mobile device. However, there’s an opportunity to give those that have a mobile internet connection (and an account with an OTT platform) an option to receive messages with their preferred messaging channel. Also, the GSMA intelligence report estimates that mobile internet users should grow to 66% in Latin America, 72% in Eastern Europe, 63% in Asia Pacific, and 51% in Middle Eastern & Norther African countries by 2025. Even as the use of mobile-internet powered messaging platforms evolves, the humble SMS reigns king in A2P messaging for businesses. Outside of its sheer reach, it’s important to consider the content, as Lauri mentioned in the webinar. While we provide two-way SMS, we’ve noticed that most of our A2P SMS traffic is one-way. That’s because the content is not designed for a response (although it may have a call to action.) So the content and context of the communication can help brands and businesses decide which channels are best for customer communication. And we’ll keep you informed as the omni-channel API evolves. Signup for our newsletter, as it’s one of the best ways to know what’s happening with our products.